Mirra's notes are Ethiopian myrrh, incense, woods and vanilla. Though I did not smell much myrrh (except in a few precious moments after Mirra’s application), incense or wood, I got blast after blast of sugary vanilla, vanilla with a hint of coconut, and finally 'vanilla flowers'. The Vanilla Monster swallowed the myrrh whole — didn’t even let out a myrrh burp. Though Mirra was described as being "delicate" "powdery" even "lightweight" in ad copy and discussion forums, I found Mirra to be overpowering on me. The first time I wore Mirra, I put on half the contents of a tiny sample vial but I smelled like I had put on half a bottle, such was the power, the super sillage, of Mirra. Thank goodness for that sample — I would have made a terrible mistake if I had bought Mirra unsniffed. Not only would I have been unable to wear it, but it would not even fit on the 'perfume retirement shelf', where my misfit colognes ("I never loved you!" "I'm sick of you!" "Some gift YOU were!") go into service as room sprays till their expiration. Mirra is an Eau de Parfum with lasting power that must be experienced to be believed. I would say this scent is 100 percent in the feminine camp but men who wear Robert Piguet Fracas or Chanel No. 5 with aplomb might consider it. A 50ml spray bottle of Mirra is $79. For buying information, see the listing for i Profumi di Firenze under Perfume Houses. 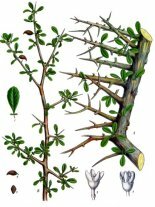 Note: image of Commiphora myrrha via plant-pictures.de. With you on this one. I like a lot of the iPdFs (although I mostly don't think they're genius, and the markup is extraordinary in the US). But this one was all wrong. How do you feel about SL La Myrrhe? I do get myrrh from this, but I do get a lot of vanilla. I am so underwhelmed by the whole iPdF line. I just tested this two nights ago, and I completely agree with your review. I was very excited to try a myrrh scent, but was disappointed. I got a lot of vanilla and coconut, and even with just a small dab on the wrist I thought it was overpoweringly sweet. My favorite myrrh scent is Les Nereides Imperial Opoponax, which is certainly sweet, but so much more wearable in my opinion. I am relieved that I sampled Mirra first, because when it was first released I was quite tempted to order it unsniffed. There's also that other one … Atkinsons Mirra Mirra? The I Coloniali scent, though (it's called “Mirra & Mirra”), is very sweet, with loads of either vanilla or benzoin–I think the latter. It's extremely nice, but not what Kevin would want, I think. (My blog review is at http://1000scents.blogspot.com/2006/12/bitter-with-sweet-mirra-mirra.html, if you're interested.) I haven't tried the I Profumi di Firenze version so I can't compare them. Always been very interested is La Myrrhe and I'm soon going to get to try it, thanks to a generous reader of NST and Posse. I understand it's very feminine, which I imagine the Diptyque is not. (I've never tried Trois, but I keep meaning to. The reviews comparing it to an outhouse always freak me out a bit.) What is your favourite SL, K, just so I can get an idea of the sort of things you normally like? Really?!?! I must just kill the vanilla off. I got mostly myrrh, and I'm grateful. Hmmm. The SL's I have are Ambre Sultan and Fumerie Turque…which are on the “sweet” side! HA! The “outhouse” reference to L'Eau Trois…THAT I don't “get”…L'Eau Trois is one of my favorite scents…earthy, yes, dung-y, NO! If you find Ambre Sultan sweet – which I don't at all – you probably won't be able to bear La Myrrhe. But at least it doesn't have vanilla or coconut. I can't stand those two notes. Bela: I don't know why anyone thought myrrh could stand up to the vanilla/coconut onslaught. Then STILL calling the result — “Mirra.” I'm very curious to try La Myrrhe again…when I first sampled it I had not burned myrrh resin or even smelled real myrrh. There's a boutique here in Portland that carries a number of the iPdFs, (well they used to carry more, but they've cut down on the line a little, weeded through some that were so dull I can't even remember a thing about them) and they've yet to get the Mirra. I was hoping they would, but now… not so much. That sounds utterly underwhelming… many of their florals I've tried are, too, unfortunately. I guess they can't all be winners? I still think their Ambra del Nepal is the best thing they make, and I did fall for Zenzero's warm charms finally (comfort scent.) They do vanilla themes extraordinarily nicely. Blush Beauty Bar. They're on NW23rd, but I don't remember the exact address or anything – I just always head for 23rd and set to wandering up and down. They've also started carrying a wee selection of the mini bottles of some of the more popular iPdFs, too, which is nice. They started carrying a line from the UK I'd never heard of: S'Amuse? It's pretty skippable, I thought, but I guess others must feel differently. They don't have the Rich Hippies anymore, either, which my bummed my sister out. (Not sure when that happened: it's been a little while since I was last there.) And the selection of the Sage Machados has gone down, too, much to my chagrin. But I did pick up a bottle of Frank LA there, which I was delighted to find.